5 ways to avoid creating the dreaded 3 Word Slogan. | My name is Kervie and I'm not here to make sense. We see it everywhere – company slogans that were made after long hours of thumbing through the thesaurus looking for similar words. They even make a point (All the pun intented) to add a period after each word. A successful advertising and marketing campaign consist of several working parts that leave potential customers wanting more. You need a hook, a signifier and a differentiator. Musicians use great catchy beats and rhythms; blockbuster movies use mesmerizing special effects and great companies develop influential messages. Let’s face it, if any company wants to make a lasting impression to build brand recognition and loyal customers, there are some simple ways to achieve that goal. Here are a few thoughts to consider to avoid the trap of using Three. Word. Slogans. One of the best branding practices is to create captivating, intriguing and even controversial messaging. If you create slogans that only uses adjectives and does not evoke any actual thought and real emotions, you automatically fail to make an impact on your customers. Make them excited. Make them daydream even for a minute. Make them imagine using your product or service. If you can get them to do any of that, you already got them interested. Now that you got them interested, are you initiating an active response? Are you enabling your viewer to connect and perform an action that will lead to a sale? Do you make your links and website domains clear? Does your ad have a clear enough message? If not, then you should re-write and re-think about your messaging to get them to re-consider why they should be in your store to buy your products and use your services. You have to capture their ideals, connect with their morals and their significant emotions to connect with them. People can sniff out a fraud easier these days. We have the technology to look up everything online and get reviews from people who have genuine experiences from powerful brands. If you’re great at one thing, you should focus on that strength and tell the world. People become repeat customers when they have great experiences with honest brands. It would be a challenge for any company to get customers when their reputation relies having a sub-par product or service. So don’t hide behind a lazy 3-word slogan. Tell your unique story by explaining what you do best. Now, let’s be clear for one second. The type of slogans I’m referring to are the ones combining 3 adjectives that are lazily put together to directly describe an image, a deed or a setting. The type of slogans that tries to paint a picture by simply using the most common descriptive words. What if Nike, decided to go a different route than using their now world famous “Just Do It” slogan? What if they agreed, that their best message would be “Run. Walk. Jump” ? I can guarantee that they would’ve lost millions in shoe sales from that point on because of how poor and unconvincing that statement is. So, let’s dive into an example on how a big existing brands utilize a 3-word slogan and how we can make it better. 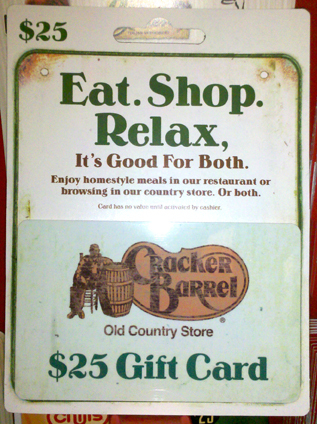 So here we have a popular Southern Country-Themed restaurant chain that has, you guessed it, food, shopping and some rocking chairs for relaxation while waiting for your name to be called in for a table. Not too sure about you, but my idea of relaxing is laying on a hammock or sprawled on a sofa watching Netflix. I believe this was the perfect opportunity for Cracker Barrel to draft up a slogan that would appeal to interstate travelers and people familiar with the South in a way that is more personal. Why not something along the lines of, “Experience the South whichever direction you’re headed” This way, you engage and leave a meaningful message to travelers and viewers. Successful brands are the ones that have loyal customers that have a unique and sometimes indescribable connection to them. Be it their the quality of their products, the level of customer service or sometimes we can tie it in to the “cool” factor. For something to be memorable, it has to be timeless. It has to uphold a powerful message strong enough to be used over and over and over again. Examples of some of the most memorable brand slogans in the world that doesn’t use 3. Single. Words. So there you have it, a couple of ideas to think about the next time you are creating slogans for a new identity, an advertisement or a marketing campaign. You have to strongly believe in your message and use it appropriately. It’s a difficult undertaking, but, if you can make your customers remember your brand by your meaningful slogans on top of your exceptional product and service, then that is a worthwhile endeavor.